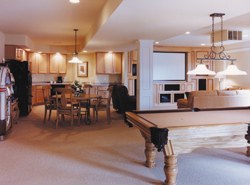 House plans with walk-out basement foundations are popular for many reasons. As with all basement types, this style may be finished or unfinished. Home designs with walk-out basements have a separate entrance from outside the home (as well as inside), and one can simply walk into or out of the basement from that entry. Walk-out basements usually have plenty of daylight in the areas facing the entry, so their space can be used in a variety of ways. Also, they are perfect for a sloping lot, since much less digging will be necessary. 1999 Sq. Ft., Width 40'-0", Depth 52'-6"
The Shay Rustic Modern Home has 4 bedrooms and 4 full baths. 3242 Sq. Ft., Width 50'-0", Depth 58'-8"
The Kamari Modern Home has 4 bedrooms, 3 full baths and 1 half bath. 3026 Sq. Ft., Width 41'-0", Depth 52'-0"
The April Acres Ranch Home has 4 bedrooms, 2 full baths and 1 half bath. 4508 Sq. Ft., Width 71'-2", Depth 64'-6"
2754 Sq. Ft., Width 58'-0", Depth 50'-0"
1342 Sq. Ft., Width 50'-0", Depth 66'-2"
2134 Sq. Ft., Width 39'-0", Depth 39'-0"
Discover home plans with walk-out basement foundations in all sizes and styles at House Plans and More. Build a new home with all of the features you long for including a walkout basement and have the ability to expand the amount of living space by finishing this part of your home in the future. Home designs with walkout basements offer great flexibility for any homeowner.